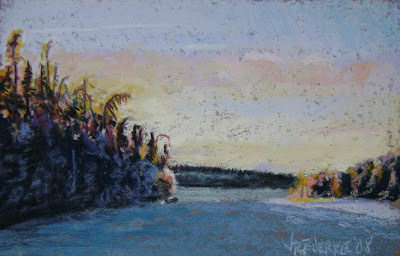 This is one of the pastel paintings I did on the second day of Artists by the Sea. These cliffs are at the end of the road my parents live on, and if when you are standing facing the cliffs you turn 180 degrees, you see this: Needless to say, it's a lovely spot. This was the first time we painted there, but we had such a nice time I'm sure we'll paint there again. My sister also did a lovely painting of the same beach cottage, although hers looks completely different. Our paintings of this beach cottage were both snapped up quickly and for a fair price. 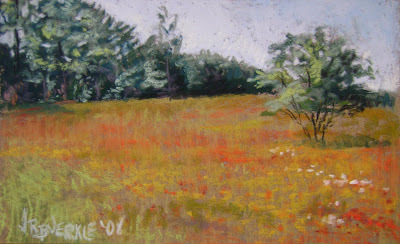 This painting is one of the ones I did at Artists by the Sea this year. My sister and I went to our usual afternoon haunt on the Saturday - the deck of the St. Andrews Yacht Club. By this time in the afternoon it was quite sunny. We're going to have to start finding somewhere else to go, as we've gone there every year and there's only so many times you can paint the same view of the wharf and boats, although people never seem to tire of buying the paintings! That's the one perk I guess. :) Both of these are watercolours. Just for fun I've included the 2009 version of the wharf, this one in pastel. Clearly I'm more comfortable with that medium! After a very long hiatus from blogging, I am back. :) The main reason for my absence was the loss of the cord that connects my camera to my computer. In its absence I couldn't get photos off my camera, and attempts to do so by other means were disastrous. I nearly lost all 1,100 photos I've taken over the past 10 months. But luckily, Applebee's image centre came to my rescue and managed to recover all the photos from my camera's corrupted memory card. This means that I now have 10 months worth of photos and events to catch up on! I'm going to start with one of my favourite annual events; the St. Andrews Artists by the Sea event. This is a charity event which raises money for the hospice of charlotte. Local artists gather to paint on-site for a weekend, and the paintings are auctioned off in three silent auctions, two on Saturday and one on Sunday. My sister and I have been participating in this event together since 2007 (with last year being the one exception). This year I thought I'd be brave and try her chosen medium, watercolours. 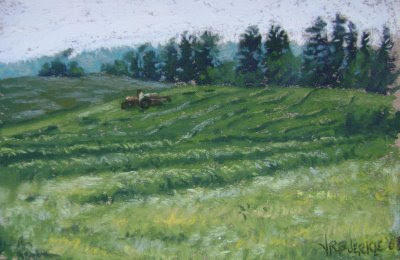 I'd never painted plein air (or on-site) with watercolours before, and it presents an interesting and completely different challenge than painting plein air in pastel. Anyway, the two paintings in this post are my first two (and favourite) attempts.